Cricketing legend Steve Waugh will return to St Clair Oval on March 20 for Waugh in the West Series II Twenty20 cricket match. 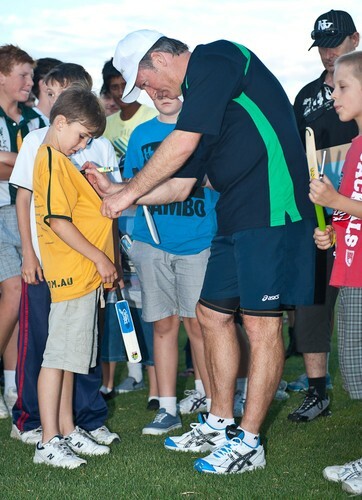 This year, Steve Waugh will lead a team of South Australian Celebrity All Stars against the Grange Cricket Club. He will be hoping to replicate his performance last year when he scored 69 runs. Former Australian and South Australian cricketer Wayne Phillips will again emcee the event with former cricketer KG Cunningham. Grange Cricket Club is hoping to follow the success of the Woodville District Cricket Club who last year won the inaugural Waugh in the West battle. Waugh in the West is a free community event hosted by St Clair joint venture partners AVJennings and Urban Pacific and the City of Charles Sturt Council. On the night, there will be free family entertainment including kids face painters, jumping castle and competitions run by the local junior sporting clubs. Spectators are welcome to bring along a picnic or purchase food and drinks from one of the many participating stalls. The event will also raise money for the Steve Waugh Foundation which works to improve the quality of life for Australian children and families affected by rare diseases. The Waugh in the West action starts at 4:30pm, ready for the coin toss at 5pm.